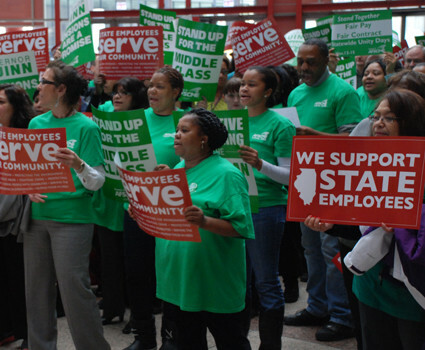 This coming Monday, members of American Federation of State, County and Municipal Employees Council 31 (AFSCME), the largest union in Illinois, will be voting on whether or not a strike would be on the table during negotiations with Illinois Republican Gov. Bruce Rauner. Over the next three weeks, union members at 711 work sites across the state will have opportunities to cast ballots on the question. The secret ballot vote is open to all AFSCME members, except those with security-related jobs who aren’t allowed to strike. It is not open to nonunion members, including those who pay so-called “fair share” fees to compensate the union for its contract negotiation services. There is no current plan to strike, however. The question put before workers is whether to authorize the union’s collective bargaining committee to call a strike down the road, as contract negotiations with the Rauner administration have been stalled for the past year. Gov. Rauner, more and more frustrated in his attempts to break down AFSCME, has also tried to go after the Teacher’s Union this past year as well. Gov. Rauner, as with most Republicans and “fiscally conservative” elected officials, like to use state budget concerns to hit workers, education and those needing the most support before they actually make the wealthy pay. The governor also touted $1 billion savings each for state and local governments if lawmakers changed public employee pensions by basing it on whether workers give up the right to have future pay hikes included in their retirement calculations. Rauner once again said Democrats, who have supermajorities in the House and Senate, should either negotiate with him and minority Republicans or pass a tax increase and override his veto. Rauner has made union-weakening provisions in state law a precondition for considering a tax increase. Gov. Rauner wants, in essence, to give big business a tax break on property and is holding the budget hostage in order to break down the union in order to get that. Gov. Rauner is a classic wealthy tax cheat of a man who really doesn’t care what happens to people as long as his personal bottom line increases.